A tiny implantable brain sensor could someday monitor conditions within the skull before dissolving away. Currently being tested in rats, this technology tracks temperature and pressure levels, potentially offering a new option for how brain injuries are studied and treated. By melting away when no longer useful, these micro-sized sensors remove the risks associated with current technology used to monitor brain injuries, according to a University of Illinois press release. The study, led by John A. Rogers, professor of material sciences and engineering at the University of Illinois at Urbana-Champaign, and Wilson Ray, professor of neurological surgery at the Washington University School of Medicine in St. Louis, is published in the journal Nature. "This is a new class of electronic biomedical implants," Rogers said in the release. "These kinds of systems have potential across a range of clinical practices, where therapeutic or monitoring devices are implanted or ingested, perform a sophisticated function, and then resorb harmlessly into the body after their function is no longer necessary." Rogers stressed that the technology now used for monitoring after traumatic brain injuries or brain surgery can be dangerous for patients. Systems involve bulky wires that restrict patients' movements, and invasive implants may lead to brain hemorrhages, allergic reactions, and infections. By contrast, the tiny dissolvable silicon devices that Rogers' team developed are smaller than a grain of rice. They are naturally biodegradable -- built up on incredibly thin silicon sheets -- and dissolve away after a few weeks of monitoring brain activity. They melt harmlessly into the human body's own fluids, the researchers say. These devices are sensitive to pressure levels in the intracranial fluid that surrounds the brain, and have a temperature sensor synced to a wireless postage stamp-sized transmitter that is placed on top of the skull. "If you simply could throw out all the conventional hardware and replace it with very tiny, fully implantable sensors capable of the same function, constructed out of bioresorbable materials in a way that also eliminates or greatly miniaturizes the wires, then you could remove a lot of the risk and achieve better patient outcomes," Rogers added. "We were able to demonstrate all of these key features in animal models, with a measurement precision that's just as good as that of conventional devices." 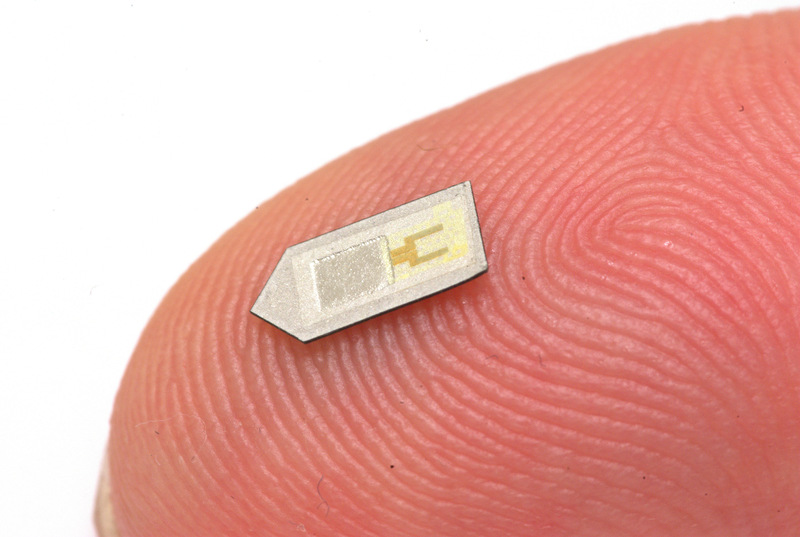 The lab tests with rats were to see how compatible these tiny devices would be with a living organism's body. So, what's the next phase? The team hopes to move toward human trials soon. "The ultimate strategy is to have a device that you can place in the brain -- or in other organs in the body -- that is entirely implanted, intimately connected with the organ you want to monitor and can transmit signals wirelessly to provide information on the health of that organ, allowing doctors to intervene if necessary to prevent bigger problems," Rory Murphy, a neurosurgeon at Washington University who was a co-author of the paper.